يقع في باراماتا, فندق ميركيور باراماتا إنه المكان الأنسب لاكتشاف سيدني و ما يحيطها. يمكن من هنا للضيوف الاستمتاع بسهولة الوصول إلى كل ما تقدمه هذه المدينة النابضة بالحياة. كما يمكن الوصول بسهولة إلى مزرعة اليزابيث, Rosehill Gardens Racecourse, ايكسبيرمنت فارم. إن حسن الضيافة والخدمات الراقية التي تعرف بها Accor Hotels تغني تجربتك في فندق ميركيور باراماتا. إن خدمة الغرف على مدار الساعة, خدمة التنظيف يوميًا, مكتب الاستقبال على مدار الساعة, مرافق مخصصة لذوي الاحتياجات الخاصة, تسجيل وصول/خروج سريع هي جزء فقط من الخدمات التي تميز فندق ميركيور باراماتا عن باقي الفنادق في المدينة. في الفندق غرف نوم يتجاوز عددها 165، كلها مجهزة بعناية وجمال وبعضها مزود بـ تلفزيون بشاشة مسطحة, غرف لغير المدخنين, مكيف هواء, مكتب, ميني بار. يمكنك الاستمتاع بالأجواء المريحة التي تقدمها حوض استحمام ساخن, حمام سباحة خارجي, سبا, ملعب تنس طوال النهار. اكتشف مزيجاً ساحراً من الخدمة الاحترافية والخيارات الواسعة من وسائل الراحة والمتعة في فندق ميركيور باراماتا. موقف السيارات متوافر بشكل مجاني و لكنه أمر عائد للتوافر. إن كنت ترغب بالحصول على مكان لركن سيارتك يرجى ذكر هذا في حقل الطلبات الخاصة عند إجراء الحجز. غرفة متميزة بسرير بحجم كوين. Guest Parking r charged Aus 15.00 per day. Need to highlight to guest. I have stayed before and will return again for predictable 4* comfort and convenient Parramatta East location. A good base to park car and access Parramatta by foot, or into Sydney & inner suburbs by ferry or train. Many food options close by are a bonus. It is away from the Paramatta Train Station and city centre. Highly inconvenience with no attraction around. The hotel charges AUD0.55/minute for the use of wifi. Isn't this highly exorbitant? They do not even offer hotel room slippers nor a single bottle of drinking water. So, when you just stepped in thirsty you have to drink tap water at the risk of having diarrhea or boil your own water and wait 30 minutes for it to cool down. By then I probably die of thirst.! i didn't have great expectations for Mercure Parramatta, i chose it for its location and i had hoped it would be a nice place to end our holiday before i had to fly out of the country. From the moment we arrived i has surprised at the facilities and the excellent service provided. My children enjoyed the pool thoroughly, the rest of the facilities were very good and as the place is close to a major shopping centre we were able to to buy a few things as well. i am extremely happy with our time there. a big thank to all staff, you were the friendliest hotel staff we encountered in our two week holidays. thank you. 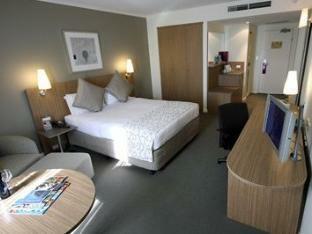 I had a great stay at the Mercure Hotel Parramatta. The staff was very helpful and always willing to help to insure I had a good time. The train station was very close and getting off and on the bus was also very easy. Going from the Airport to the Hotel was very easy and it made my trip so much more hassle free. I would for sure recommend this Hotel and stay here again. The staff were great, the room was clean and very comfortable and breakfast was very good. 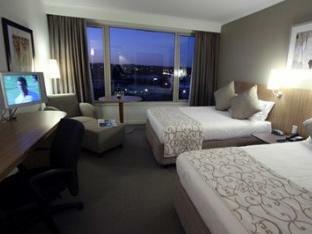 Our stay at the Mercure Hotel Parramatta overall was great. The main plus for me was how helpful and courteous the staff were, espesially at the front desk and in the breakfast restaurant area. Excellent!!! Very comfortable bed, really friendly helpful service. Very good, the only challenge was it was further from the train station than we had been told (rather than a 12 min walk depending on your pace) it was a 20 min fast pace walk to get to the train station. Needing to catch the train every day that proved to be a little bit of a challenge. It was great . when we mentioned it was my birthday , I was given a bottle of red wine as a gift . As it was pouring ,we decided to stay in and had room service dinner ( pretty average) and access to 24hrs of blockbuster movies on in-house movies for the low cost of $24.95! We had a very indulgent and relaxing evening watching the latest movies in the comfort of our cozy bed , sipping champagne and listing to the miserable weather outside . My room was much nicer than I expected for the price except for a shower recess that had dark mould around the top of the bath and light mould all around the shower tiles. It was well below standard and I have never seen anything like it in 40 years of hotel stays. The rest of the room was immaculate so it is a little surprising. I asked the staff to clean it and they organised for it to be done. It was much better but clearly shows that it has been badly cleaned for a long time. If, as was said, it was not able to be cleaned better, the tiles need to be replaced - this is a completely unacceptable standard for this hotel. It is very uncomfortable getting into what amounts to a dirty public shower. My stay was convenient and comfortable. The free car parking and supermarket / fast food opposite saved money. 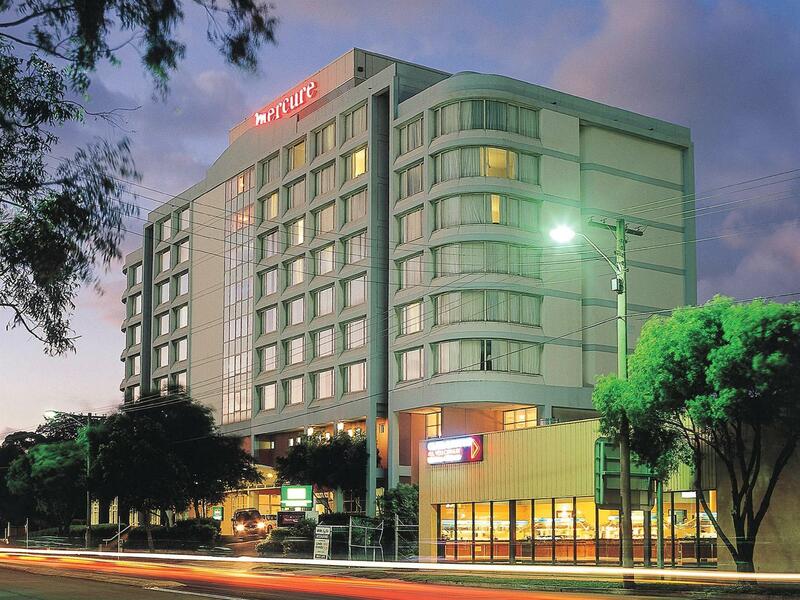 Whilst a few km away from Parramatta CBD (by car), the hotel was a convenient base for activities in the district. I did not need to use hotel facilities; but room was good. The hotel served the purpose of my trip this round. pleased with the double twin beds provided by the hotel, they were very comfortable and the pillows too. room is spacious but i think the hotel is old it actually needs a massive renovation. i found the toilet and bathtub are stained, this makes the hotel not so presentable for a four start rated one. Mercure Parramatta has very nice rooms and is situated just outside the CBD of Sydney, which makes it less busy and noisy. The hotel has several amenities to offer and has very accommodating staffs. Parking space, though a bit quite narrow, was adequate. Stores, food chains and groceries are conviniently just in walking distances. the location of this hotel is in a nice quiet area, close to train stations and bus stop, so you can leave your car at the hotel and take the train into the city. it's also easy to get onto the highway to the blue mountains. the facilities and room are good and reasonable. the only thing about this hotel is that they have a lot of chinese tour groups who don't mind banging doors and having a loud chat in the corridor around 11pm. We like the Mecure when we are staying at Parramatta due to the free parking. It's just a nice simple hotel to stay at, and usually you can get some great deals online. My only critism would be a slightly rude woman working in the breakfast buffet, but all other staff are professional and friendly. We were very impressed that we were able to park our Hi Top Van in a section of the driveway each night of our stay. The room was very comfortable and well planned. The major shopping centre across the road was very useful and convenient.